All really good writers get paid for their work. Gone are the days of being a starving writer with no income. If you started writing thinking it's a way to make a fast buck. Think again. 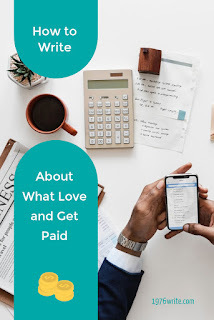 In this post I'm going to show how to write about what you love and get paid. Yes it's that simple, by opening up your mouth and asking your nearest friends and family if they know of anyone that might be in need of a writer. Start asking your contacts about ad agency work or companies that might need a writer such as copywriting services, web developer or graphic designer. Ask your nearest and dearest to lookout for bad grammar on menus, emails and brochures etc. There are a lot of people who would love to have their own thoughts in print but they have no real passion to get it into print. That's where your ghost writing abilities come in. Use your wordsmith skills to bag some new clients by sending emails. If you want to work for a particular company keep your eyes on their job board and see what kind of writer's they're looking for. A lot of companies often take on freelance writer's because full-time writer's are harder to keep. Drop them a line every now and again. Agencies always need writer's, make a list of your local companies and tell them what you do. Editing and proofreading positions are a good way to get your foot in the door, and also to let them know that you're a writer with added editing skills. Self-publishing has flourished and writer's are jumping at the chance to get their work published on paper or digitally. Copywriting is a huge part of blogging and also a well-used strategy to draw in copywriting clients. Try magazines such as Freelance Switch and Smashing Magazine for guest post writing. A good writer can make money from blogging, by not only running ads but also adding links into their posts. After you've engaged your audience with your dazzling blog posts you may have followers that want to learn from you and do the same.